The theme of the book of Ecclesiastes can really be summed up by the idea that everything is meaningless [Ecc 1:2|Article]. It is a sentiment often repeated and sets the general tone of the book. Everything in this world is meaningless, every worldly pursuit and knowledge and desire is meaningless. Ecclesiastes 3 opens us up to Solomon‘s perspective on the concept of time. In this study we will once again reflect on the concept of eternity and how we as humans find it difficult to reconcile our concept of time to God’s concept of eternity. He has made everything beautiful in its time – Do you know that different flowers look prettiest in different seasons? Different fruits are the tastiest in different seasons? 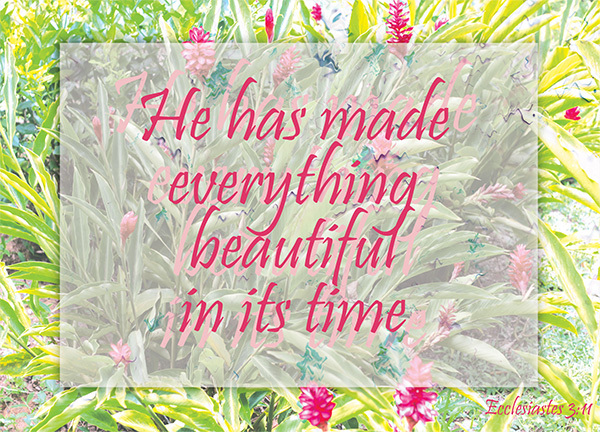 There is a time for everything, and in God’s own time, there is also a time to be beautiful. God is the creator of all things [Col 1:16], and all things are made by him in wisdom for his glory. Everything will come to fruition in God’s own time, in God’s own ways – some problems may be solved immediately, some may take a while, others may take a long time. Some issues will be solved easily, others may require a miracle. Some troubles may be resolved when God sends aid through others; some may see God resolving it himself. Indeed, And we know that in all things God works for the good of those who love him, who have been called according to his purpose [Rom 8:28|Article]. He has also set eternity in the human heart – as Christians we believe in eternal life. We hence believe in the concept of eternity, even if we aren’t always able to fully comprehend the weight of eternity. But it is not Christians alone who hold the exclusive rights to eternity. All humans have eternity. All humans possesses eternity in their hearts, whether they believe in God or not. We don’t always think about it this way, but as Christians we believe that those who believe in God will have eternal life – and that’s what we call salvation, while those who do not believe in God will have eternal death in hell. That’s eternity too, but a painful, hopeless and meaningless eternity. Eternity in the concept of Christianity has always been looked on positively, but it can be a terribly frightening and dreadful prospect. We all have eternity in our hearts – God has given each of us the natural and innate ability to appreciate eternity – but not all of us understand that God runs on the clock of eternity. It is only when we truly appreciate the concept of eternity that many things begin to make sense to us – like suffering, for instance. Our elongated suffering on earth may seem like a long time, but when we cast it in comparison to our prospect of eternal life, what is 3 years, 8 years, or even 20 years? It’s a bit like salvation. Did Jesus die on the cross to save everyone? I would say yes, he did – he did it for everyone, but not everyone will be saved eventually. Only those who declare with their mouths that ‘Jesus is Lord’ and believe in their hearts that God raised him from the dead will be saved [Rom 10:9]. But if Jesus hadn’t died for us, nobody would have been saved, no matter how much we declared with our mouths that Jesus is Lord. It’s the same thing for eternity. God has already set it in our hearts – but it’s up to us if we want to learn it or not. It’s up to us if we want to walk the path of eternal life or take the path that leads to eternal death. It’s already on our doorsteps. We just need to open that door. yet no one can fathom what God has done from beginning to end – we may have eternity in our hearts, but we can scarcely begin to fathom it. We struggle even to understand the meaning of life in our short 80-odd years of life, so how can we be expected to grasp the weight of the works of God from beginning to end? I think even if I spend every single second of my remaining life just sitting there and listening to the list of what God has done, I wouldn’t have a long enough life to finish listening to his deeds, what more fathom the meaning of them? There are some things in life that remain a mystery. Divine mysteries. And it’s probably for our own sakes that God chose not to reveal these things to us, for we probably wouldn’t be able to handle it. We aren’t often reminded of it – but we can choose to remind ourselves of the beauty of God’s works and creations just by looking around us. Our own bodies are the greatest machines. The nature, the world – how much do we know about these? Humans spent hundreds and thousands of years and countless generations finding out how the human body works. How the solar system works. How the ecosystem works. And yet there are still so much out there we do not know. Everything is beautiful, if you would only stop and take a look. Every problem has it’s amazing solution, only if you would stop and take a step back. Every suffering has a meaning – even if you live out your life without ever truly knowing why. Everything works for the good of those who love God – in all things God works for the good of those who love him. Everything will work to complement each other, cover up for each other, fill the gaps left by each other. That’s the beauty of God’s creations. That’s the beauty of us as humans. Eternity exists, even if we do not understand it fully. Yet when we begin to understand the concept of eternity, it will be when we truly understand that our sufferings are but just temporal. When we begin to understand the concept of eternity, we will appreciate God’s promises better. as always your last paragraph inspires and blesses. thank you and bless you…and as you always say to me, thank God for you. I love the last paragraph. It’s beautiful. You have put the meaning of this into words so much better than I ever could. I hope you don’t mind that I have quoted you on my own blog (http://artybexa.com/2015/08/11/bible-art-journaling-everything-beautiful/). Thank you for the inspiration.